The beauty of the Frangipani tree is that it fits in so well with different style gardens. They are seen as tropical trees, however can be grown in cooler climates in the right position. An increasing range of flower colours are available for sale online in Australia. These colorful trees and plants are also known as Plumeria and the ‘Lei flower’. Generally reaching around 5 – 6 metres in height, they are easily pruned to size. They grow well in containers and have a non invasive root system. Plants that you buy can be easily pruned and will do well in pots. We suggest a well drained heavy terra cotta pot. 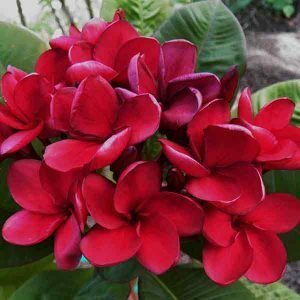 As they require a well drained soil use a potting mix that does not have any added ‘water saving crystals’ or similar, these can cause root rot in frangipani plants. 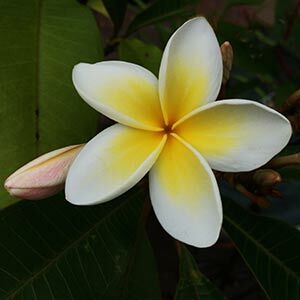 This is one of the most important aspects of Frangipani care. These are a reasonably drought tolerant plant one established. They do not like wet soggy soils, and require little water in winter. In is in summer when they begin to put on growth that you will need to water them once or twice a week. In the ground, in good soil with a little mulch around them you may not need to water them much at all. A sign of overwatering is when the tips of the branches begin to wilt. Again, a little goes along way. These are not hungry plants and in good soil, an all purpose, slow release fertiliser once a year is usually adequate. An appropriate fertiliser in most Australian soils, and in pots is the release fertilizer is.. In the ground try digging in some well rotted animal manure and potash before planting, and use a mulch with well rotted manure, and ash. Any fertilizer with a high in N.P.K is suitable in most cases, but the experts say to stay away from those with a very high P (phosphorous) count. We suggest the well rotted compost and animal manure, watered with a seaweed fertilizer and some added potash is a good homemade fertilizer. A well drained humus rich soil is best. In containers use a good quality free draining potting mix and repot every 3 – 4 years. Choose a sunny position protected from strong winds. Frangipanis do need around 6 hours of sun a day to grow and flower well. Growth Rate – Regarded as slow. Lifespan – Frangipanis are long lived in good conditions. Prune after the dangers of frost have past. Prune back to good healthy growth. The flowers have great perfume and a huge range of colours from white with pink through to yellow, purple and red. These fragrant flowers are a fantastic addition to the garden as well a great cut flower. For Melbourne, Victoria and Adelaide try growing Frangipani rubra, it does seems to be the best, but no frost and good drainage. With many new interesting hybrids now available to buy watch out for new flower forms and colors. ‘Dwarf’ or miniature cultivars such as Duvauchelle (Dwarf) and Dwarf deciduous white cultivars. Easily grown from cuttings, although they are often very slow to ‘get going’. With such a great variety of established frangipani trees available, growing from cuttings is left to the enthusiast. Cuttings can be taken as hardwood cuttings in winter, or softwood cuttings in spring to summer. In either case let the wound heal before planting in a sharp sand and compost. Cuttings will need support while new root systems form. Plumeria stenopetala is a very rare dwarf evergreen species from Cuba. The large pendant flowers smell strongly of carnations. Plumeria caracasana is a beautiful rare evergreen with huge spoon shaped leaves & large flowers on long upright stalks. A very ornamental large growing tree. Plumeria tuberculata is a beautiful rare upright shrub. A rare evergreen species from Cuba. The coldest place we have heard of is in Switzerland, and yes they are grown indoors. In Australia, try Noojee at the foot of the Great Dividing Range, and yes again they are grown indoors. However given the right conditions and a little care you can successfully grow Frangipani plants in Melbourne (outdoors). Try growing them in a container in a sunny position against a north facing wall. In a container you can move them in winter to an even more protected position if you need to. Perhaps a sunny patio. Where can you buy Frangipani plants ? The easiest way to find the best varieties, and access more flower colours is to buy them online. Plants are easily packages and sent by post, complete with growing instructions.